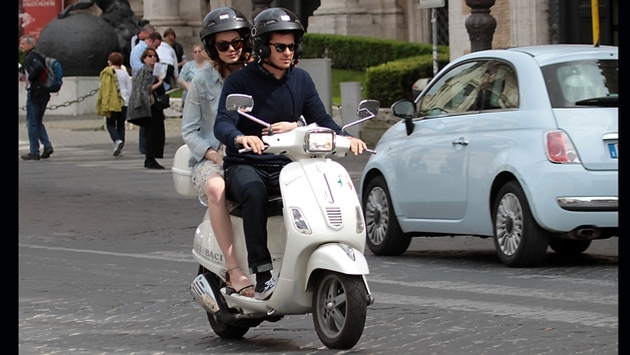 Emma Stone and Andrew Garfield enjoyed a "Roman Holiday"-inspired vespa ride while in Rome on Sunday (April 13) afternoon. Just like Gregory Peck and Audrey Hepburn's sweet adventure in the 1953 classic film, Emma and Andrew enjoyed a romantic sightseeing tour of Rome. Andrew, 30, drove the vehicle through the busy streets, while Emma, 25, wrapped her arms around her beau. The onscreen and offscreen lovebirds, who have been overseas promoting the "Amazing Spider-Man 2," were recently spotted strolling hand in hand (a rare sign of PDA for the couple) through Disney Studios at Disneyland in Marne-la-Vallee, France on Friday (April 11). That same day, the couple stepped out for the Paris premiere of their highly anticipated movie. On Thursday (April 10), the duo attended the film's London premiere. In March, Andrew and Emma visited Sydney, Australia and Tokyo, Japan for promotional purposes. "Amazing Spider-Man 2," which will be released in the United States on May 2.